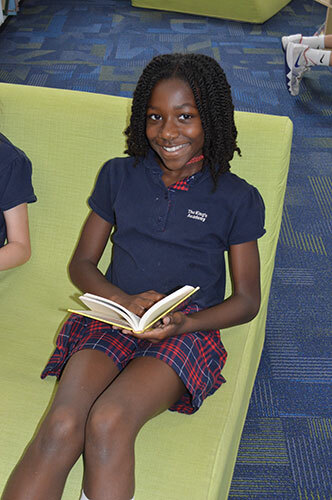 (West Palm Beach, FL) – West Palm Beach, FL- The King’s Academy’s upper elementary school students have partnered with Heifer International’s Read to Feed program and the 4th graders were thrilled to surpass their first goal of 14,000 pages before Thanksgiving! They have been busy reading books toward the goal of improving the lives of families around the world. The program helps students support families in need by providing animals that produce food and fertilize crops. As a result of our 4th graders’ accomplishments, a flock of chicks has been purchased on their behalf and will be sent to a family in a country where the needs are great. The family who receives the chicks will receive care-taking training in order to produce hundred of eggs in the future. Having eggs will not only provide nutrition for the family, but will also assist monetarily for medicine, a more secure shelter, and the ability to attend school once the eggs are sold in markets. King’s 4th graders have moved on toward their second goal, and our 5th and 6th graders are reading boldly to provide families with a goat and a heifer!